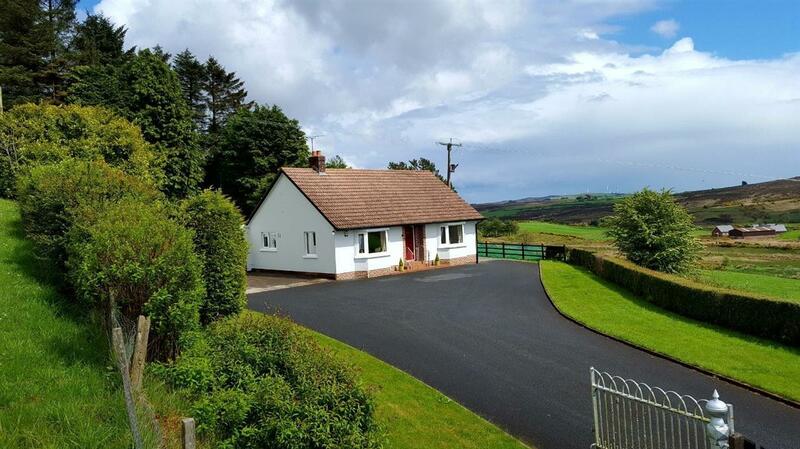 Alice’s Cottage is located just outside the village of Mountfield, which is 6 miles (10min) from the market town of Omagh. The cottage was built in the 1950’s and has recently been tastefully modernised and decorated while retaining its original character. The cottage is situated on an elevated site which affords visitors spectacular panoramic views of the surrounding countryside. The cottage sits in mature gated grounds adjacent to farmland which is used for grazing. As the cottage is south facing it basks in sunshine all day on a sunny day. The cottage has a living room with open fire, kitchen dining area with patio doors opening on to a small courtyard (ideal for barbecue). The master bedroom has a double bed or twin beds, whichever is required and an en-suite. The second bedroom is a double and the third a single. The bathroom is located beside these rooms. The cottage has free Wi-Fi. A pet enclosure is provided. The village of Mountfield is within walking distance. It has a small supermarket, two pubs a takeaway food outlet and two churches. A number of other amenities and attraction are located in the greater Omagh area. Whether you are planning a break to visit relatives, explore the area, an activity break, a family get away or simply a place to recharge your batteries why not try Alice’s Cottage.